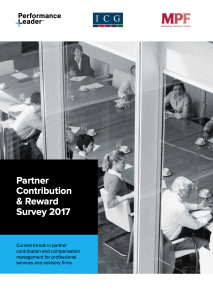 While the ‘Partner Contribution and Reward Survey’ provides a useful update on the emphasis (or lack of it) placed on performance management within the Partner group of professional services firms, it also offers a fresh insight into the performance management conversations that do take place among some Partner groups. In short, performance management conversations are often ineffective within Partner groups because poor performance is rarely, if ever, addressed. In contrast, high performance is rewarded and praised. We believe there are three key factors behind the current ineffectiveness of performance management activities: ‘Contingent Management Authority’; not knowing how to undertake peer-to-peer coaching conversations and underdeveloped emotional intelligence. Why is management authority contingent in professional services firms? Professional services firms are usually owned by the Partnership group. Partners who have been in the Partnership group for some time are elected by their peer group to the formal positions of authority, such as Managing Partner or Chairman. Equally, as the peer group can elect someone to the position of authority, they can also be removed if they do not keep the support of their peer group. It is easy to understand why Partners in senior positions might not like to undertake difficult conversations with their peers, for fear of upsetting an ally in the Partnership group and losing their leadership mandate. These dynamics are far more prevalent in professional services firms as they do not follow the hierarchical leadership structure found in most industries. It is our belief that some leaders in professional services firms haven’t sufficiently developed the skills and behaviours to undertake difficult conversations or ‘coaching’ sessions with underperforming Partners. “Qualitative feedback from our survey suggests that more rigour is needed, with respondents calling for ‘accountability’, ‘structure’, ‘discipline’ and ‘support’. Undertaking reviews with people who have performed well is easy and these types of conversations take place regularly, but knowing how to have difficult, challenging and potentially emotive interactions with peers is something different entirely. Many Partners may have learned the basics of coaching on manager training programmes earlier in their careers but it is likely that this training will have assumed a manager-subordinate interaction. In fact, because of the previously identified unique dynamics found within the leadership group of a professional services firm these peer-to-peer conversations could be even more complex than in traditional hierarchical organisations. That is, everyone in the Partner group perceives themselves as a leader, expects a high level of autonomy and will resent being cast as a follower to anyone. The third question is whether the Partners have developed the emotional intelligence skills to navigate difficult conversations? The critical skill required for building consensus, finding common ground and taking decisions – even within challenging performance management conversations – is emotional intelligence. Unfortunately, emotional intelligence is often underdeveloped in professional services firms as greater credence is given to technical/functional/sector knowledge over ‘soft’ skills. At the start of their careers, employees usually find themselves valued for their generalist abilities but, as they progress and eventually make it to Partner level, they are increasingly encouraged to become specialists and are praised and promoted for success in their field. The result is that Partners can end up narrow and specialised not having developed the required emotional intelligence skills to undertake difficult peer-to-peer interactions, or difficult conversations with clients. Additionally, when competing with colleagues for promotion to the Partner group, it is perhaps easier for an individual to distinguish themselves based on their level of knowledge and expertise than their level of emotional intelligence. Emotional intelligence is a skill. It is not ‘self-confidence’, ‘initiative’ or ‘charisma’ as is often misinterpreted in professional services but a skill that can be trained, practised, developed and improved.